Godin, Seth. 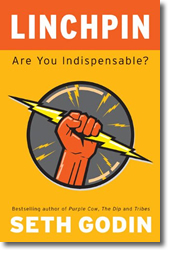 Linchpin : are you indispensible? Portfolio, 2010. Best-selling author Seth Godin has written his latest book for employees in the new world of work. Employees have been trained to be a cog in the industrial machine, yet ultimately, the way to achieve success is to stand out and to become indispensable. Godin calls those people “linchpins,” and they cannot be replaced because their roles are just too valuable. To become a linchpin, a worker must seek opportunities to do more than what is assigned. They must take the initiative to do what is necessary for the organization to succeed. Linchpins connect easily with other people and work collaboratively with coworkers and customers. They make positive things happen. Godin encourages everyone to become an “artist” at work by being creative, making connections and finding joy in work. And he encourages everyone to put their heart and soul into all aspects of their lives. Linchpin is Seth Godin’s twelfth book since 1999 and it reads as if it were written in a hurry. The style is choppy and terse. The ideas could have been presented in a much shorter and better organized format. I found this book a chore to read, but on Amazon.com, other readers rated it very highly, with the reviews averaging 4.5 stars, far better than most. © Reviewer: Meg Trauner & Ford Library – Fuqua School of Business. Kossek, Ellen Ernst, and Brenda A. Lautsch. 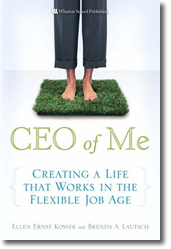 CEO of me : creating a life that works in the flexible job age. Wharton School Publishing, 2008. As women boomers began graduating from college forty years ago, an emotional debate erupted about whether working women were harming their children, who were enrolled in daycare. As women continued in the workforce, there was a siren call for workplace flexibility and the discussion changed to the relationship between work and family life. And this discussion, an issue for both men and women, has continued for 30 years. Using interviews from hundreds of professionals and managers, authors Kossek and Lautsch identify common patterns that people adopt as they try to manage the balance between work and family. After readers identify their own patterns, they can see the conscious or unconscious choices they are making that are barriers to a satisfying life. The book concludes by recommending practical steps for negotiating a new life. Stone, Pamela. Opting out? : why women really quit careers and head home. University of California Press, 2007. Author Pamela Stone conducted in-depth interviews with 54 high-achieving women, in high-status, high-knowledge professional fields, such as consulting, law, finance and medicine, who were all married to equally powerful men, and who seemingly abandoned their rewarding careers to become stay-at-home mothers. Rather than opting out of the workplace, these women found themselves with increased responsibilities at home and with husbands who were reluctant to help them. Beyond the mandated maternity leave, these highly successful women were unable to find the flexibility they needed to continue working in an environment where 60 hour workweeks and 24/7 availability was the norm. Even in companies where family-friendly policies existed on the books, individual managers paid a critical role in making flexibility available or taking it away. Women who were able to negotiate special favors found themselves marginalized and stigmatized. These competitive women disinvested in their careers and increased their investment in family. 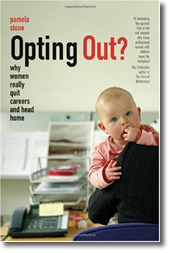 Author Stone concludes that women are not opting out of the workplace. They are being pushed out. Interesting read. Author Pamela Stone is Associate Professor of Sociology at Hunter College, CUNY. Osterman, Paul. The truth about middle managers : who they are, how they work, why they matter. Harvard Business Press, 2008. In large organizations, senior management sets the strategy — what markets to enter, with whom to merge and how much to invest. Middle managers have little voice regarding strategy, yet they are responsible for interpreting and executing those decisions. In recent years, corporate restructuring has made middle management careers less secure. 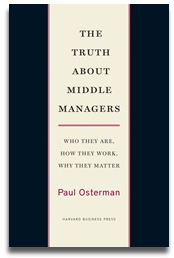 Author Paul Osterman from MIT’s Sloan School studied the careers of middle managers to determine what has been happening to middle managers since 2004. He finds that job security in middle management is nonexistent, but the number of middle management positions has increased. The work has gotten more dynamic and managers have more autonomy, keeping morale high despite the lack of job security. In the end, Osterman concludes that middle managers are committed to their jobs and their immediate colleagues and subordinates, but are critical of their companies and top management. They enjoy what they do and are committed to high quality work. But job paths are unclear and performance is less visible. The criteria for judging who gets ahead are confused. In conclusion, middle managers are loyal to their professions but alienated from the organizations that employ them. Lowenstein, Roger. 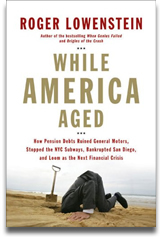 While America aged : how pension debts ruined General Motors, stopped the NYC subways, bankrupted San Diego, and loom as the next financial crisis. Penguin Press, 2008. Using three case studies, this new book in the Ford Library discusses the pension crisis that is looming over American industry. Author Roger Lowenstein begins in Detroit in the 1940’s, where the UAW bargained for pensions in labor contracts. General Motors complied because promises for future benefits did not incur costs in the present. Pension and health care costs for retirees would not come due until many years in the future. Over time, the union’s success brought the company to the brink of bankruptcy as the number of retirees grew, the benefits grew and those promises came due. Lowenstein also discusses two other cases, transport workers in New York City, whose union led a strike in 2005 that brought the city to a standstill, and the pension crisis in San Diego, sparked by city officials who doled out benefits to city workers but declined to impose higher taxes. The final chapter in the book suggests changes in the ways corporations, unions and the government manage benefits, paying for them in the present, instead of charging them to a future generation. 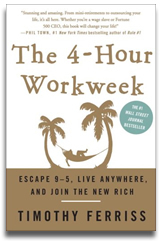 The 4-hour workweek : escape 9-5, live anywhere, and join the new rich by Timothy Ferriss. Crown Publishers, 2008. This book promotes an alternative way to look at life and work. Ferris begins by describing the New Rich as people who live the millionaire lifestyle of complete freedom but have not yet earned the million dollars. The New Rich use their time effectively and work relatively few hours in positions that correspond to their strengths. Having read The World is Flat, the New Rich telecommute from home or remote locations, hiring third world employees by the hour to do boring time consuming tasks. In the end, the New Rich are able to live their entire lives doing what they want to do as opposed to what they are obligated to do. This book offers some good ideas, such as managing one’s time. Ferris also questions whether people find meaning in buying things or preparing to buy things. He suggests that people take mini-retirements throughout their lives instead of working at meaningless jobs for 30 years, saving retirement to the end. The emphasis is still on making “a ton of money,” but to Ferris, this ton of money is for specific reasons. Ferris regularly goes overboard with boasting and exaggerating, such that “snake oil salesman” comes to mind. Yet if you don’t take it too seriously, this inspirational book is a fun read. 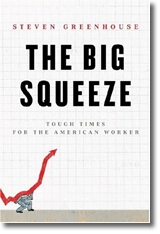 The big squeeze : tough times for the American worker by Steven Greenhouse. Alfred A. Knopf, 2008. For MBA students, the news over the past decade has been good. Employment opportunities have increased. Executive salaries have risen sharply. Corporate profits have soared. But for millions of workers, the news has been bad. For many, wages have stagnated. Heath and pension benefits have been cut back. And job security has disappeared. While the American economy, corporate profits and worker productivity grew robustly, the median income for nonelderly households remained flat. Worker productivity climbed 60% but the hourly wage increased only 1% after inflation. In the economic expansion, the size of the pie increased, but the worker did not get a bigger piece. The Big Squeeze explains what has been happening in the workplace. Weaving personal stories of workers with economic facts and data, author Greenhouse, labor correspondent for the New York Times, creates a disturbing picture of the economic environment for workers. Sheila Heen, co-author of Difficult Conversations: How to Discuss What Matters Most, will be at Fuqua to discuss her book on June 3rd, 10:00 am-12:00 pm in Geneen Auditorium. Ten copies of this book are available in Ford Library. Click on the title or covers below to place a hold or check the availability. For more book choices, see the list below or please check out our Special Features section in the reading room. Are you interested in attending the Duke MBA Leadership Experience conference (Building World-Class Leadership Teams) developed and hosted by the Leadership Development Initiative (LDI)? Well here are some new titles available at the Ford Library to help get you in the “swing of things”. Click on any title below to check availability or to place a hold.